Sports are defined by the rivalries they create. You know the great ones, Yankees-Red Sox, Lakers-Celtics, Duke-North Carolina, Ali-Frazier, but none have carried the hype and appetite that this rivalry has stirred up in just ONE year and without ever playing on the same field. 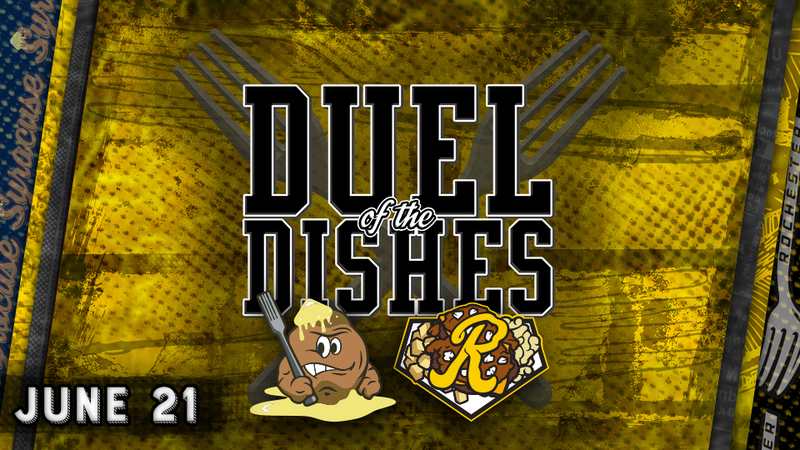 But that changes in 2018 when the Rochester Plates and Syracuse Salt Potatoes square off in the Duel of the Dishes on Thursday, June 21 at Frontier Field presented by Express Mart. The two teams will also play Saturday, August 25 at NBT Bank Stadium in Syracuse. A (one-sided) rivalry which began on the interwebs will finally be settled at the dish! Help settle the dispute. Which is better? At stake is the coveted 8-foot Golden Fork and some good-natured fun between the two teams' top chefs - Dan Mason and Jason Smorol. The Plates will be giving away a one-of-a-kind, Duel of the Dishes 'Fight Night' style poster to the first 2,000 fans courtesy of Express Mart Convenience Stores on June 21. Thanks to this salty tweet from Syracuse, we'll be sure to have several variations of a Plate that DO NOT include their precious potatoes available on this night as well. A commemorative 'Duel of the Dishes' t-shirt with a 'Top 10 Reasons Why Rochester is Better Than Syracuse' list on the back will be available in the weeks leading up to the game. June 21 is also our first Thirsty Thursday Pre-Game Happy Hour of the season presented by Bud and Bud Light with $2 beers and live music from Rob Gioia out at the 10th Inning Bar. Every Thursday, students with a valid college ID can purchase reserved level tickets for just $10 which includes 5 Diamond Dollars that can be used at the Team Store or Frontier Field concession stands. The Plates will put together a fan bus trip to Syracuse for the August 25 Plates-Potatoes game. More details to follow. The Red Wings 2018 season begins at Frontier Field on Friday, April 6 at 6:05 pm against the Buffalo Bisons! Single-game tickets for all 70 home games are on sale now at RedWingsBaseball.com. The Red Wings Ticket Office will open for the first time on Friday, March 23 for the 2nd Annual Baseball's Back Bash.